Be the first to share your favorite memory, photo or story of Raynard. This memorial page is dedicated for family, friends and future generations to celebrate the life of their loved one. 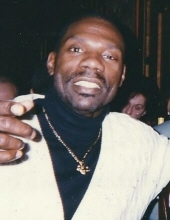 Raynard Stuart Lockhart, 59, of Willingboro, NJ answered God’s call and walked into His Everlasting Arms on Monday, April 1, 2019. Raynard Stuart Lockhart was born July 20, 1959 to Elaine T. Lockhart and the late James W. Lockhart in Orange, NJ. He graduated from the East Orange School system in 1978. Raynard was the Head Supervisor for The Grand Summit Hotel in Summit, NJ under the tutelage of his late father, James W. Lockhart. However, he moved on to bigger and better things and was a graduate of the NJDOC Training Academy in Sea Girt, NJ where he became a State Corrections Officer. Raynard married Vonne Davis Lockhart in 2005. Raynard worked as a State Corrections Officer for Craf (The Department of Corrections) in Trenton, NJ for 18 years and received a posthumous promotion Police Officer after his death. He was an avid bowler and loved cruising the seas. Raynard also loved hosting barbecues and sitting in his backyard with family and friends firing up his smoke pit. Raynard leaves to cherish his memory: his wife, Vonne Lockhart; his children, Sharif Raynard and Tariq Stuart Puryear; stepchildren, Freda Davis, Lane Davis and Sherod & Gigi Davis; grandchildren, Jalyn, Jaysun, Emir and Kayden Puryear, Desiree Mack, Jasir Eden, Shamari Smith, Dajanae Colon, Nina Sawyer, Sa’miyah Brinson, Seyoni El, Jamil, Seth and Sherod Davis Jr.; his mother, Elaine Lockhart; his brothers, James V., Durand S. and Nazir K. Bey Lockhart; and a host of family and friends. He was preceded in death by: his father, James W. Lockhart; grandparents, Abel & Cornelia Simpkins and James B. Tisdale; his brother, Keith (Kelly) Lockhart; stepson, Stephon Brinson; uncles, Harry Tisdale, Ralph and Stafford Simpkins; and aunts, Yolanda Fields and Mildred White. Raynard will continue to be in our hearts Always and Forever! This Online Memorial has been created to commemorate the life of Raynard S. Lockhart. Leave a message on the Tribute Wall to share your favorite memories and offer words of sympathy and comfort. To send flowers or a remembrance gift to the family of Raynard S. Lockhart, please visit our Tribute Store. "Email Address" would like to share the life celebration of Raynard S. Lockhart. Click on the "link" to go to share a favorite memory or leave a condolence message for the family.